Can You Drive on Winter Tires Year Round? When you live in Western Canada, you know it is valuable to prepare your vehicle for winter conditions. Because of this, we tend to invest our dollar in things like seat warmers, defrost systems and winter tires. The last example is a divisive issue– many people swear by all-seasons or may not enjoy the hassle of changing tires over; meanwhile, others love the added grip of winter tires and may even have them mounted on their own set of rims. In a place where low temperatures can last for months on end, some might wonder if you can drive on winter tires all year round. If you are considering this, please read Park Muffler’s article below on the scientific and logical argument against it. The key difference between all-season, winter and even summer tires is the firmness of the rubber compound that makes up the tire itself. 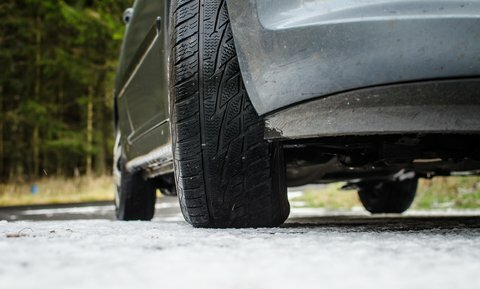 Winter tires are at the softest end of the spectrum and summer tires are the firmest– as you may have guessed, all-season tires fall somewhere in between depending on the manufacturer and model. The “7°C threshold” is an important rule of thumb for determining a tire’s performance in different conditions. When outdoor temperatures are at 7°C or below, the rubber compound used to make winter tires is giving your vehicle top performance. Above that threshold, winter tires become too soft– this causes a variety of problems such as reduced stopping power and accelerated wear. All-season tires bridge this gap, while firm, summer tires suffer the same problems below the 7°C threshold. So, can you drive on winter tires all year round? Yes. Should you? No! Winter tires wear down very quickly in warmer conditions, especially on those summer road trips. Even if you do not notice the change in your vehicle’s performance, you will ultimately end up replacing your tires more often. So, it makes less financial sense to not swap the winter edition for an all-season or summer counterpart. Questions? Concerns? Contact the pros here at Park Muffler today!